Rating: 7.3/10. From 26 votes. Summary: The description, specs, MSRP and photo for the Kimber Super Carry Ultra HD pistol. Kimber’s Super Carry Ultra HD is a compact, 1911-style semiauto chambered in .45 ACP. It’s a steel-framed version of Kimber’s Super Carry Ultra, which is built on an aluminum frame. Features include night sights with a cocking shoulder, Carry Melt treatment for rounded edges that will not cut or snag, beveled slide serrations for positive operation, an ambidextrous thumb safety, an aluminum match-grade trigger , G-10 checkered grips and Kimber’s Pro II finish. Kimber’s Custom Shop enhancements include a recessed slide stop pin with a surrounding bevel, a high-cut under trigger guard for recoil control, aggressive front strap serrations, and a serrated mainspring housing. 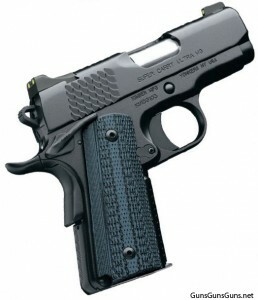 This entry was posted in .45 ACP, $1,501-$1,750, 1911, Compact, Kimber, Semiauto on May 19, 2011 by Staff. This gun is simply the ultimate in each and everyway measured…………..